Eighty years of business adds up to a lot of projects, and that means a lot of questions. Our team is experienced, available, and happy to help — but do you know what to ask them? Over time, we’ve paid attention to the most common questions that come up in glass manufacturing, and thought we’d give you a head start on your next project. We’ve found that these are the most important points to consider in order to ensure every client selects exactly what is needed. What temperature and pressure ranges can your materials handle? It’s important to consider every facet of your design’s projected performance and exposure before selecting a material. Manufacturers like Swift Glass keep an immense inventory, with both raw materials and ready-made products available. 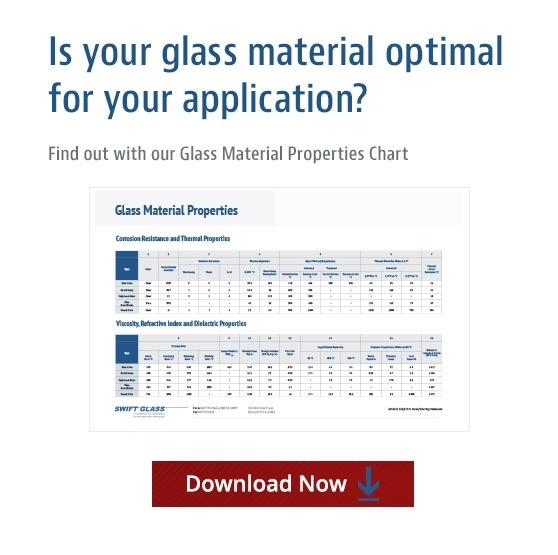 This wide range of choices means that it’s more likely we’ll have the perfect glass in stock to meet your desired temperature and pressure ranges. We carry Float, Pyrex®, Borofloat®, Quartz and Vycor®, covering nearly any high temperature or pressure application. Once you’ve determined your project’s range, check out our website, eBook resources, or call the team for material-specific details and reference charts. What is the difference between tempered and non-tempered glass? Once glass is machined to final size, it may stay as annealed or it can be tempered in a heat treatment process. This process heats the glass above the strain point; then rapidly cools the glass- putting the surfaces in compression. Doing this operation increases the resistance to thermal shock as well as making the glass able to withstand up to 4 times the amount of pressure compared to un-tempered glass. How quickly can my project be completed? How can we reduce our project’s costs? What is the vendor’s production volume? These are our most common questions, and they’re a great place to start! Find the whole eBook here on our website, or contact the team with your own questions today.